Two Metrobuses collided at a Silver Spring bus stop at 7:15 this morning, injuring 23 people, many of whom were high school students. 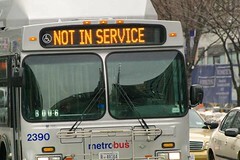 The striking bus was cited for “failing to control vehicle speed” by Montgomery County police. The bus sustained damage to its windshield and front door in the crash. A WMATA spokesman declined to release the names of the drivers involved in today’s incident. The injuries required that several people be transported to local hospitals, but none were thought to be serious.